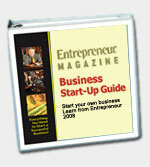 BusinessMart.com strongly recommends Entrepreneur Magazine's Import & Export Business Start-Up Guide. For more information read below. To purchase this book click on BUY NOW. This bestselling guide is your passport to success. As a top import/export agent, you can net a healthy six-figure income by matching buyers and sellers from around the globe, all without leaving home. You don't need any specialized training or experience to succeed--this guide teaches you everything you need to know to become an import/export professional. We even include overviews of 16 foreign markets to help you get up and running--and making money--quickly. Order today, and start navigating the exciting world of international business.